Last week, India announced growth figures which would make the world envious. Asia's third-largest economy grew 7.5% in the three months ending in March, higher than the previous quarter and above expectations. Forecasts were for growth of about 7.3% for the period compared with a year earlier. But the new growth figures have come at a time when Indian companies are at their weakest in two years. Earnings are flat and profits are down. Most major industries, including infrastructure and automobiles, are struggling. Historically, says Business Standard newspaper, when India's growth has hit 7.5% at constant prices, corporate revenues and profits have soared above 14% on average. So how does the economy grow so fast when corporate growth is so slow? A month after the government declared a new way of calculating GDP, India baffled experts in February when it announced 7.5% growth between October and December compared with the same period a year earlier. The latest figures again raise questions about the new way. Some critics say the government is raising GDP figures to meet fiscal deficit targets, and trying to present a rosier picture of the economy. Economists such as R Nagaraj say the new and higher figures "seem quite at odds with other economic indicators such as growth in bank credit, the index of industrial production and corporate performance". Even the government's Economic Survey earlier this year found the new growth figures "somewhat puzzling" when compared to the falling savings, investments and exports. 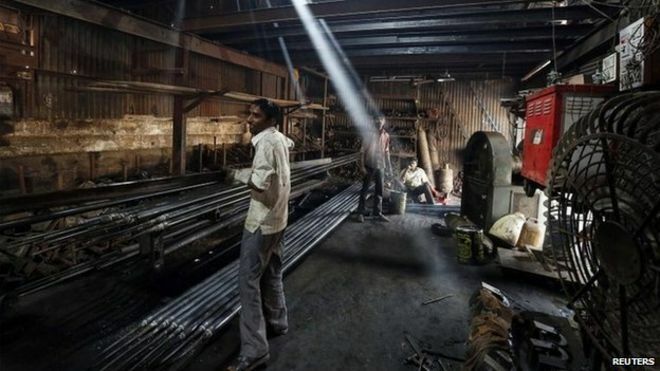 India's government has defended the new way of calculating GDP by saying it is using an improved database for the private sector, in place of the earlier, smaller sample of large firms with high paid-up capital. It also said it had taken into account half a million companies which had been used for the first time in the series. India's economy is a complex beast. There's a thriving "underground" or black economy which evades taxes, while more than 90% of India's workers are employed by small businesses which employ less than 10 workers. "The new methodologies are very convoluted. So far, the increase in GDP does not appear to be reflected in the performance by companies and the markets. So either the government was getting it wrong all these years or they are presenting a far sunnier picture of the economy than it actually is," says analyst Paranjoy Guha Thakurta, who has been sceptical about the figures. Economist Arvind Virmani calls this India's "growth puzzle". He says this can be explained by the "extremely dualistic nature of the Indian economy". On the one hand, the country has a small organised sector comprising mainly large state-run companies. On the other, it has a large, unorganised and informal sector, catering exclusively to its vast domestic market.